Review: Do you like books that are funny? Silly with some suspense? This book Roland Wright Future Knight is a debut book, first in the series. Young Roland has dreamed of going to Page School, but since he is but a poor armor forger’s son, he may never get in. Even his brother, Shelby knows that he and Roland will never get a chance to become even a weak swordsman. Although, one day Sir Gallawood, a famous knight known for his bravery and smarts, comes in search of Oliver Wright, Roland’s father. Sir Gallawood had gotten himself in a predicament, and when Roland’s father helps him get out of it, he offers the boys that only one of them can go to page school. Oliver offers the boys a deal. They have a competition. They must make a sword and shield, and then they will exchange and battle. Who will win? Read on to find out. 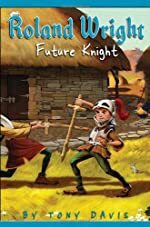 Roland Wright Future Knight is a beautifully done book for ages 6-10, although I think that all ages would enjoy this book. Tony Davis is a remarkable author, with a unique style of writing. Out of 5 stars, I would give it all 5. Tony does an excellent job of illustrating a picture in your mind, because he gives details that make you feel as though you’re actually in the book. I am eagerly awaiting the next book right now, Roland Wright Brand New Page. With his pet Nudge, Roland is on top of the world. I greatly encourage all of you readers to get a head start, whether you be 9 or 99. We would like to thank Random House for providing a copy of Roland Wright: Future Knight for this review. Have you read Roland Wright: Future Knight? How would you rate it?